IBM® DB2® tools for z/OS® support and exploit the most current versions of DB2 for z/OS. These tools are integral for the administration of the DB2 for z/OS environment and optimization of data performance. 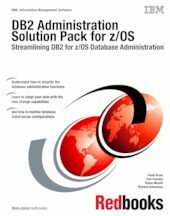 DB2 Administration Solution Pack for z/OS V1.1 (5697-DAM) offers features, functions, and processes that database administrators (DBAs) can use to more effectively and efficiently manage DB2 environments. This IBM Redbooks® publication shows how the delivered capabilities can help DBAs to more easily complete tasks associated with object management, change management, application management, and configuration management.